You are here: Home › News › Here Comes the Sun! 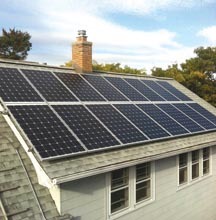 by Peggy Schulz Have you been thinking of installing solar electric panels on the roof of your Riverwest home or business? Works, on Canal Street in Milwaukee. off the remaining amount, after the other discounts are applied. credit union, for those who are unable to get a home equity loan. program, to be sure that solar panels will work in their location. location will pay off in the long run. brought the concept of a group buy to the session. says. “It’s not just going to happen. installation on residences and small businesses. Booth Street between Chambers and Burleigh last October. of the gas from deep underground. 1 megawatt of power!” Berger exclaims. possibility of installing solar panels on their buildings. Learn More: The Solar Riverwest website, in development now: www.SolarRiverwest.org Milwaukee Shines: www.city.milwaukee.gov/milwaukeeshines The Midwest Renewable Energy Association: www.midwestrenew.org The Me2 program of the City of Milwaukee: www.smartenergypays.com. Monday, March 11, 7PM KICK OFF!! Riverwest Public House, 815 E Locust St. Tuesday, March 26, 6PM Woodland Pattern, 720 E Locust St Monday,April 1, 7PM Jackpot Gallery, 825 E Center St Thursday, April 18, 4PM People’s Books, 804 E Center St. Sunday, April 21, 6PM Riverwest Public House, 815 E Locust St. Thursday, May 9, 6PM Pink House, 601 E Wright St. Wednesday, May 22, 6PM Jazz Gallery, 926 E. Center St.